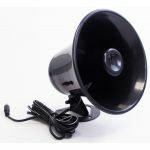 5-1/2" BLACK PLASTIC PA HORN WITH 10 FOOT CABLE AND 3.5MM PLUG. MADE IN CHINA, IN BOX. 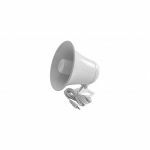 5-1/2" WHITE PLASTIC PA HORN WITH 10 FOOT CABLE AND 3.5MM PLUG. 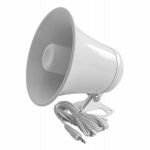 MADE IN CHINA, IN BOX. 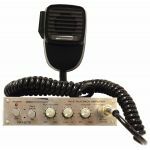 60 WATT RMS 110 VOLT AC PUBLIC ADDRESS AMPLIFIER MIXER WITH 6 MICROPHONE INPUTS/AUX/AUTO MUTE. 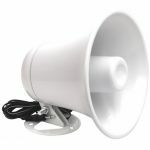 60 WATT RMS 110 VOLT AC PUBLIC ADDRESS AMPLIFIER MIXER WITH 6 MICROPHONE INPUTS/AUX/AUTO MUTE. 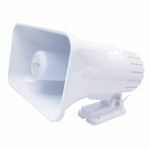 MAX OUTPUT POWER 90 WATTS.